Explain the importance of the time constant, , and calculate the time constant for a given resistance and capacitance. Explain why batteries in a flashlight gradually lose power and the light dims over time. Describe what happens to a graph of the voltage across a capacitor over time as it charges. Explain how a timing circuit works and list some applications. Calculate the necessary speed of a strobe flash needed to “stop” the movement of an object over a particular length. When you use a flash camera, it takes a few seconds to charge the capacitor that powers the flash. The light flash discharges the capacitor in a tiny fraction of a second. Why does charging take longer than discharging? This question and a number of other phenomena that involve charging and discharging capacitors are discussed in this module. An circuit is one containing a resistor and a capacitor . The capacitor is an electrical component that stores electric charge. Figure 1 shows a simple circuit that employs a DC (direct current) voltage source. The capacitor is initially uncharged. As soon as the switch is closed, current flows to and from the initially uncharged capacitor. As charge increases on the capacitor plates, there is increasing opposition to the flow of charge by the repulsion of like charges on each plate. In terms of voltage, this is because voltage across the capacitor is given by , where is the amount of charge stored on each plate and is the capacitance. This voltage opposes the battery, growing from zero to the maximum emf when fully charged. The current thus decreases from its initial value of to zero as the voltage on the capacitor reaches the same value as the emf. When there is no current, there is no drop, and so the voltage on the capacitor must then equal the emf of the voltage source. This can also be explained with Kirchhoff’s second rule (the loop rule), discussed in Chapter 21.3 Kirchhoff’s Rules, which says that the algebraic sum of changes in potential around any closed loop must be zero. The initial current is , because all of the drop is in the resistance. Therefore, the smaller the resistance, the faster a given capacitor will be charged. Note that the internal resistance of the voltage source is included in , as are the resistances of the capacitor and the connecting wires. In the flash camera scenario above, when the batteries powering the camera begin to wear out, their internal resistance rises, reducing the current and lengthening the time it takes to get ready for the next flash. where (the Greek letter tau) is called the time constant for an circuit. As noted before, a small resistance allows the capacitor to charge faster. This is reasonable, since a larger current flows through a smaller resistance. It is also reasonable that the smaller the capacitor , the less time needed to charge it. Both factors are contained in . This means that in the time , the voltage rises to 0.632 of its final value. The voltage will rise 0.632 of the remainder in the next time . It is a characteristic of the exponential function that the final value is never reached, but 0.632 of the remainder to that value is achieved in every time, . In just a few multiples of the time constant , then, the final value is very nearly achieved, as the graph in Figure 1(b) illustrates. Figure 2. (a) Closing the switch discharges the capacitor C through the resistor R. Mutual repulsion of like charges on each plate drives the current. (b) A graph of voltage across the capacitor versus time, with V = V0 at t = 0. The voltage decreases exponentially, falling a fixed fraction of the way to zero in each subsequent time constant τ. The graph in Figure 2(b) is an example of this exponential decay. Again, the time constant is . A small resistance allows the capacitor to discharge in a small time, since the current is larger. Similarly, a small capacitance requires less time to discharge, since less charge is stored. In the first time interval after the switch is closed, the voltage falls to 0.368 of its initial value, since . During each successive time , the voltage falls to 0.368 of its preceding value. In a few multiples of , the voltage becomes very close to zero, as indicated by the graph in Figure 2(b). The flash discharge is through a low-resistance ionized gas in the flash tube and proceeds very rapidly. Flash photographs, such as in Figure 3, can capture a brief instant of a rapid motion because the flash can be less than a microsecond in duration. Such flashes can be made extremely intense. During World War II, nighttime reconnaissance photographs were made from the air with a single flash illuminating more than a square kilometer of enemy territory. The brevity of the flash eliminated blurring due to the surveillance aircraft’s motion. Today, an important use of intense flash lamps is to pump energy into a laser. The short intense flash can rapidly energize a laser and allow it to reemit the energy in another form. High-speed flash photography was pioneered by Doc Edgerton in the 1930s, while he was a professor of electrical engineering at MIT. 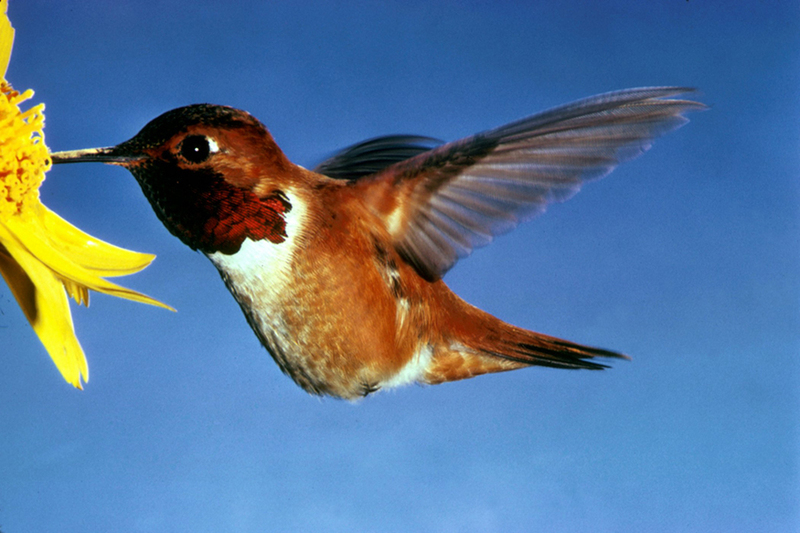 You might have seen examples of his work in the amazing shots of hummingbirds in motion, a drop of milk splattering on a table, or a bullet penetrating an apple (see Figure 3). To stop the motion and capture these pictures, one needs a high-intensity, very short pulsed flash, as mentioned earlier in this module. Suppose one wished to capture the picture of a bullet (moving at ) that was passing through an apple. The duration of the flash is related to the time constant, . What size capacitor would one need in the circuit to succeed, if the resistance of the flash tube was ? Assume the apple is a sphere with a diameter of . We begin by identifying the physical principles involved. This example deals with the strobe light, as discussed above. Figure 2 shows the circuit for this probe. The characteristic time of the strobe is given as . The flash interval of (the traverse time of the bullet) is relatively easy to obtain today. Strobe lights have opened up new worlds from science to entertainment. The information from the picture of the apple and bullet was used in the Warren Commission Report on the assassination of President John F. Kennedy in 1963 to confirm that only one bullet was fired. A more crucial use of circuits for timing purposes is in the artificial pacemaker, used to control heart rate. The heart rate is normally controlled by electrical signals generated by the sino-atrial (SA) node, which is on the wall of the right atrium chamber. This causes the muscles to contract and pump blood. Sometimes the heart rhythm is abnormal and the heartbeat is too high or too low. The artificial pacemaker is inserted near the heart to provide electrical signals to the heart when needed with the appropriate time constant. Pacemakers have sensors that detect body motion and breathing to increase the heart rate during exercise to meet the body’s increased needs for blood and oxygen. Figure 4. 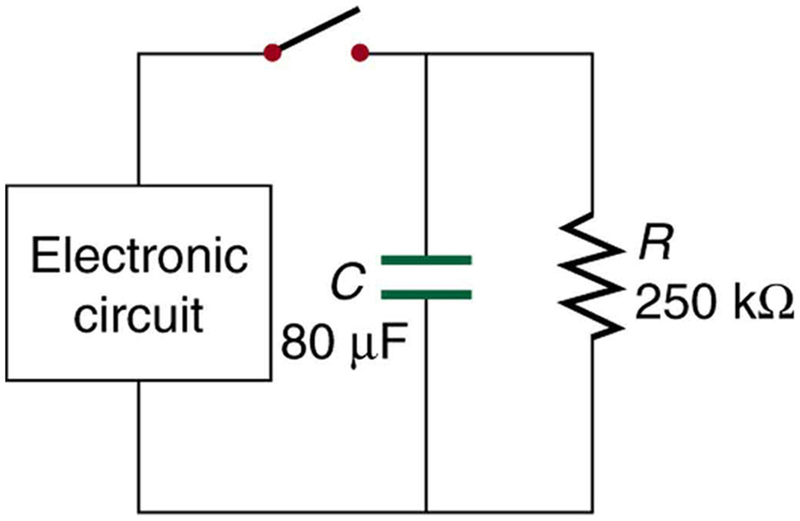 (a) The lamp in this RC circuit ordinarily has a very high resistance, so that the battery charges the capacitor as if the lamp were not there. 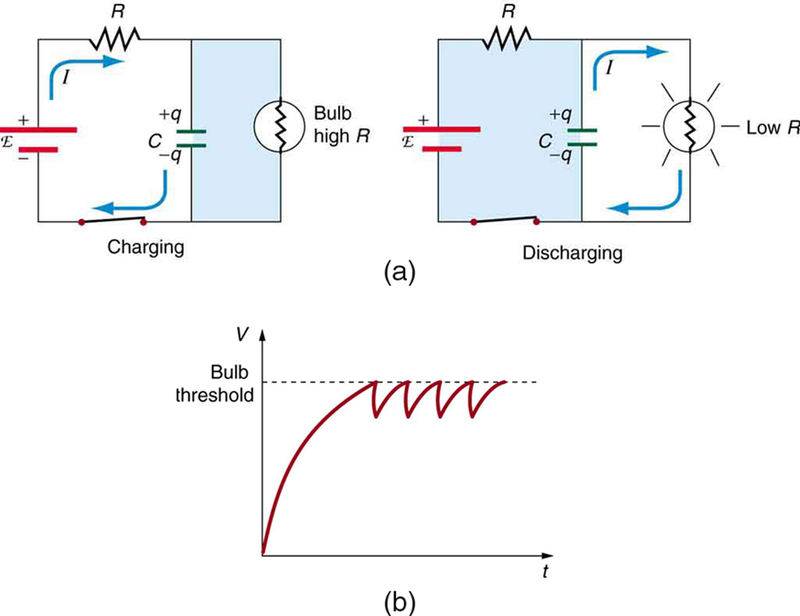 When the voltage reaches a threshold value, a current flows through the lamp that dramatically reduces its resistance, and the capacitor discharges through the lamp as if the battery and charging resistor were not there. Once discharged, the process starts again, with the flash period determined by the RC constant τ. (b) A graph of voltage versus time for this circuit. A heart defibrillator is used to resuscitate an accident victim by discharging a capacitor through the trunk of her body. 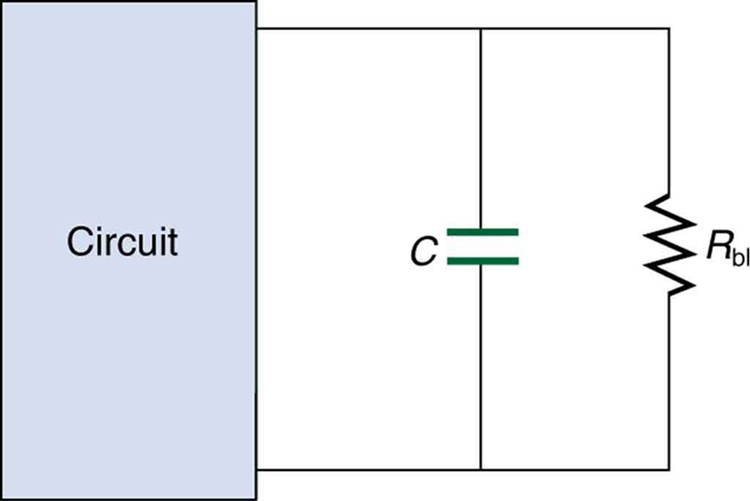 A simplified version of the circuit is seen in Figure 2. (a) What is the time constant if an capacitor is used and the path resistance through her body is ? (b) If the initial voltage is 10.0 kV, how long does it take to decline to ? Since the resistance and capacitance are given, it is straightforward to multiply them to give the time constant asked for in part (a). To find the time for the voltage to decline to , we repeatedly multiply the initial voltage by 0.368 until a voltage less than or equal to is obtained. Each multiplication corresponds to a time of seconds. So after only 24.0 ms, the voltage is down to 498 V, or 4.98% of its original value. Such brief times are useful in heart defibrillation, because the brief but intense current causes a brief but effective contraction of the heart. The actual circuit in a heart defibrillator is slightly more complex than the one in Figure 2, to compensate for magnetic and AC effects that will be covered in Chapter 22 Magnetism. 1: When is the potential difference across a capacitor an emf? An circuit is one that has both a resistor and a capacitor. The time constant for an circuit is . Within the span of each time constant , the voltage rises by 0.632 of the remaining value, approaching the final voltage asymptotically. In each time constant , the voltage falls by 0.368 of its remaining initial value, approaching zero asymptotically. 1: Regarding the units involved in the relationship , verify that the units of resistance times capacitance are time, that is, . 2: The time constant in heart defibrillation is crucial to limiting the time the current flows. If the capacitance in the defibrillation unit is fixed, how would you manipulate resistance in the circuit to adjust the constant ? Would an adjustment of the applied voltage also be needed to ensure that the current delivered has an appropriate value? 3: When making an ECG measurement, it is important to measure voltage variations over small time intervals. The time is limited by the constant of the circuit—it is not possible to measure time variations shorter than . How would you manipulate and in the circuit to allow the necessary measurements? 4: Draw two graphs of charge versus time on a capacitor. Draw one for charging an initially uncharged capacitor in series with a resistor, as in the circuit in Figure 1, starting from . Draw the other for discharging a capacitor through a resistor, as in the circuit in Figure 2, starting at , with an initial charge . Show at least two intervals of . 5: When charging a capacitor, as discussed in conjunction with Figure 1, how long does it take for the voltage on the capacitor to reach emf? Is this a problem? 6: When discharging a capacitor, as discussed in conjunction with Figure 2, how long does it take for the voltage on the capacitor to reach zero? Is this a problem? 7: Referring to Figure 1, draw a graph of potential difference across the resistor versus time, showing at least two intervals of . Also draw a graph of current versus time for this situation. 8: A long, inexpensive extension cord is connected from inside the house to a refrigerator outside. The refrigerator doesn’t run as it should. What might be the problem? 9: In Figure 4, does the graph indicate the time constant is shorter for discharging than for charging? Would you expect ionized gas to have low resistance? How would you adjust to get a longer time between flashes? Would adjusting affect the discharge time? 10: An electronic apparatus may have large capacitors at high voltage in the power supply section, presenting a shock hazard even when the apparatus is switched off. A “bleeder resistor” is therefore placed across such a capacitor, as shown schematically in Figure 6, to bleed the charge from it after the apparatus is off. Why must the bleeder resistance be much greater than the effective resistance of the rest of the circuit? How does this affect the time constant for discharging the capacitor? Figure 6. A bleeder resistor Rbl discharges the capacitor in this electronic device once it is switched off. 1: The timing device in an automobile’s intermittent wiper system is based on an time constant and utilizes a capacitor and a variable resistor. Over what range must be made to vary to achieve time constants from 2.00 to 15.0 s? 2: A heart pacemaker fires 72 times a minute, each time a 25.0-nF capacitor is charged (by a battery in series with a resistor) to 0.632 of its full voltage. What is the value of the resistance? 3: The duration of a photographic flash is related to an time constant, which is for a certain camera. (a) If the resistance of the flash lamp is during discharge, what is the size of the capacitor supplying its energy? (b) What is the time constant for charging the capacitor, if the charging resistance is ? 4: A 2.00- and a capacitor can be connected in series or parallel, as can a 25.0- and a resistor. Calculate the four time constants possible from connecting the resulting capacitance and resistance in series. 5: After two time constants, what percentage of the final voltage, emf, is on an initially uncharged capacitor , charged through a resistance ? 6: A resistor, an uncharged capacitor, and a 6.16-V emf are connected in series. (a) What is the initial current? (b) What is the time constant? (c) What is the current after one time constant? (d) What is the voltage on the capacitor after one time constant? 7: A heart defibrillator being used on a patient has an time constant of 10.0 ms due to the resistance of the patient and the capacitance of the defibrillator. (a) If the defibrillator has an capacitance, what is the resistance of the path through the patient? (You may neglect the capacitance of the patient and the resistance of the defibrillator.) (b) If the initial voltage is 12.0 kV, how long does it take to decline to ? 8: An ECG monitor must have an time constant less than to be able to measure variations in voltage over small time intervals. (a) If the resistance of the circuit (due mostly to that of the patient’s chest) is , what is the maximum capacitance of the circuit? (b) Would it be difficult in practice to limit the capacitance to less than the value found in (a)? 10: Using the exact exponential treatment, find how much time is required to discharge a capacitor through a resistor down to 1.00% of its original voltage. 11: Using the exact exponential treatment, find how much time is required to charge an initially uncharged 100-pF capacitor through a resistor to 90.0% of its final voltage. If you wish to take a picture of a bullet traveling at 500 m/s, then a very brief flash of light produced by an discharge through a flash tube can limit blurring. Assuming 1.00 mm of motion during one constant is acceptable, and given that the flash is driven by a capacitor, what is the resistance in the flash tube? A flashing lamp in a Christmas earring is based on an discharge of a capacitor through its resistance. The effective duration of the flash is 0.250 s, during which it produces an average 0.500 W from an average 3.00 V. (a) What energy does it dissipate? (b) How much charge moves through the lamp? (c) Find the capacitance. (d) What is the resistance of the lamp? A capacitor charged to 450 V is discharged through a resistor. (a) Find the time constant. (b) Calculate the temperature increase of the resistor, given that its mass is 2.50 g and its specific heat is , noting that most of the thermal energy is retained in the short time of the discharge. (c) Calculate the new resistance, assuming it is pure carbon. (d) Does this change in resistance seem significant? (a) Calculate the capacitance needed to get an time constant of with a resistor. (b) What is unreasonable about this result? (c) Which assumptions are responsible? Consider a camera’s flash unit. Construct a problem in which you calculate the size of the capacitor that stores energy for the flash lamp. Among the things to be considered are the voltage applied to the capacitor, the energy needed in the flash and the associated charge needed on the capacitor, the resistance of the flash lamp during discharge, and the desired time constant. Consider a rechargeable lithium cell that is to be used to power a camcorder. Construct a problem in which you calculate the internal resistance of the cell during normal operation. Also, calculate the minimum voltage output of a battery charger to be used to recharge your lithium cell. Among the things to be considered are the emf and useful terminal voltage of a lithium cell and the current it should be able to supply to a camcorder. 1: Only when the current being drawn from or put into the capacitor is zero. Capacitors, like batteries, have internal resistance, so their output voltage is not an emf unless current is zero. This is difficult to measure in practice so we refer to a capacitor’s voltage rather than its emf. But the source of potential difference in a capacitor is fundamental and it is an emf. 21.6 DC Circuits Containing Resistors and Capacitors by OpenStax is licensed under a Creative Commons Attribution 4.0 International License, except where otherwise noted.